Johnstown, PA, March 7, 2014—From March 8 through March 31, youth from the Goodwill® GoodGuides® Youth Mentoring Program will proudly display a creative and unique photography exhibit appropriately named Through My Eyes at the Community Arts Center on Menoher Boulevard in the Westmont section of Johnstown. Members of the community are invited to the Opening Reception on Tuesday, March 11 from 6:00-8:00 P.M. 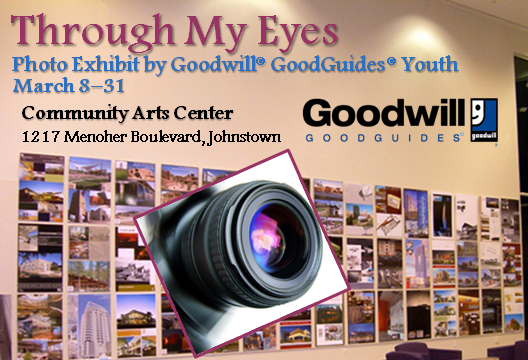 The Through My Eyes exhibit will showcase personal photographs that the youth have taken over the past 12 months at various events and venues throughout the Johnstown community under the mentoring, guidance, and direction of the Greater Johnstown Camera Club. Through this partnership, Goodwill Industries is introducing youth to photography as a hobby, possible career choice, and form of self-expression. This mentoring experience is designed to help youth find their “voice,” identity, and creativity and gain confidence. The GoodGuides program and the Greater Johnstown Camera Club are also presenting photography mentoring activities to camera club students at the Greater Johnstown Alternative School and ACRP St. Michael’s School. Photographs that they have taken since October 2013 will also be part of the photo exhibit. For more information, contact Cindy O’Connor, GoodGuides Program Manager at coconnor@goodwilljohnstown.org or (814) 536-3536, ext. 304.